Kelly Reichardt’s previous two movies have been lo-key gems. The lost in the woods burn of Old Joy and the one girl and her dog dilemmas at the heart of Wendy And Lucy. Both have taken small scale stories and got deep enough into their protagonists heads to make their problems as important as any world saving plot, if not more so. Wendy being distraught over the fate of her dog Lucy is played against almost complete poverty, it was the first film I thought caught the depressing zeitgeist of a post-credit crunch world. So perhaps its an odd choice for her to then move to a pioneer western next with Meek’s Cutoff. Unsurprisingly though, she brings her own style and sensibility to embue a more traditionally suspenseful story with empathy for the individuals in what is still a small story. Three wagons on the Oregon Trail have gone their own way, being guided by a grizzled old frontiersman Meek. As the film starts the pioneers start to think that perhaps Meek is lost, and trust is dipping. There is a family, a younger couple and a pair of May to December newlyweds along with Meek. Meek holds all the cards here, at least until the capture a Native American out on the plains who has been following them. Meek wants to kill him, but his stock is low with the pioneers. They consider trying to use their captive as a guide, figuring he will lead them to water if he wants to live himself. And such is the suspense between life, death and who to trust. Around it there are lovely vignettes of frontier life, and almost a battle for leadership and even suffrage with Michelle Williams’ newlywed eventually gaining more agency here than even her husband. 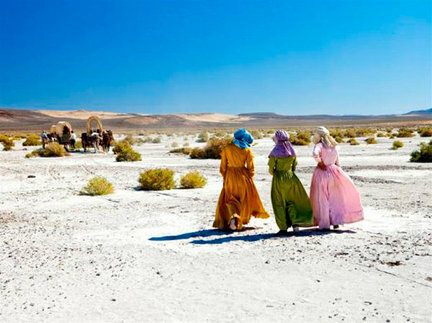 A frontier film lives an dies on how well the film expresses the desolation of this barren land. Reichard has always excelled with her locations, but here she manages to embue the broad canvas beauty of American Pastoral art of the trail, with the sense of its absolute emptiness. The endless scrub may as well be a desert, and the ten, fifteen miles a day a trial. The desperation for a better life gambled in one shot between a grizzled untrustworthy blowhard or an incomprehensible local. Meek’s Cutoff is based on real testimony of the journey from mainly the women’s diaries, and Reichardt has created a more female focussed Western here, even down to the air of hopelessness that the women suffer silently under. Which brings us to the ending. The name of the film refers to the point where they have to trust in their guides totally. Meek’s Cutoff is the point where they could turn back and probably make it back to water. But it also has another meaning in the film around the ending, reminiscent though not as melodramaticas John Sayles Limbo. In both films the audience is left to make much the same decision as the characters, who do we trust, and even if that trust is correct, how will it end up. Its an audacious end, theatrical in many ways and infuriating to some audiences. But as Shirley Henderson said in the Q&A after the film at the Festival, when asked how she though the pioneers ended up; They made it. Some of them must have, as we have the testimony. What it means for these fictional analogues of real people is unclear. But just as they don’t have the luxury of maps, perhaps leaving the audience without a clear end at least partially gets us into their heads. We are as lost as they are, and if we want resolution we have to put our own faith into it. I decided I couldn’t do two bleak Michelle Williams movies in one festival, and went for Blue Valentine instead. You’ve at least got me wondering if it was the wrong choice. Blimey. I found this to be a prolonged exercise in tedium. I suppose one could say it accurately reflected how interminable trekking across the west must have been, but that’s about it.